Time to groom your baby’s nails and you are feeling stressed over it. Nails grow very fast on their tiny fingers, and you need to cut them before they harm themselves. When grooming their tiny fingers, it is a known fact that they require more attention so that you don’t nick their fingers. It is always advised to keep their nails trim and clean since they keep putting them in their mouths. The nails in babies’ fingers grow much faster than their toenails. So fingernails would need more number of trimmings than the nails in their legs. It is best to invest in a good nail clipper to help you trim your baby’s nails confidently. In this article, we will provide you with reviews of the best baby nail clippers that are available for you to buy. We will also provide you with a step by step guide as to which nail clipper would suit your baby and make you feel confident in using it. Getting to trim the nails of your baby or toddler can be a daunting task. They are usually very unpredictable with their movements, and a slight jerk can result in nicks or cuts. 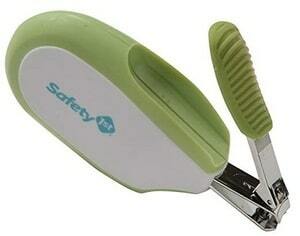 Electric baby nail clippers are very easy to use with no sharp edges at their sides like the ordinary nail clippers. This minimizes the risk of causing injury to your child. 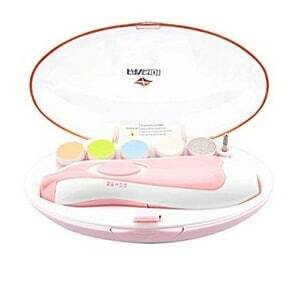 Since the nails of kids grow very fast, it is much easier to trim them using this electric nail clipper. This electric nail clipper has different files and different speeds to suit every child’s requirement. Very easy to use and convenient to change the files. The trimmers can’t shape the nails of the babies, which makes them uneven and sharp. They run on batteries and can be expensive at times. Babies usually do not have control over their movements, and this can cause nicks and cuts when you are trying to trim their nails. Using these electric nail clippers, you can safely groom their nails without having to worry about causing any harm to them. Trimming your child’s nails can be a challenging task. They continuously keep moving, making clipping difficult. The larger size of the handles makes it easier to grip the clipper while you keep your focus on the finger. The clipper is sharp enough to cut the nails without cutting into the skin of your baby. This clipper comes with a safety feature in which the clipper slots back into the holder. Soft to the touch handle. The cutting edges are curved. The body is made of plastic because of which the grip becomes difficult. The size of the handle provides a good grip and makes you feel very confident while trimming the nails of your little one. The cutting edges are curved to minimize the chances of causing cuts to the skin. When you are unsure and feel stressed to trim the nails of your little one, these baby scissors will help you feel confident again. With these, you can trim their nails even when they are awake or fidgety. These scissors come with rounded edges that make them super safe for trimming nails. Baby nails are very small, and you can have trouble viewing them while trimming. With these scissors, you can accurately cut their nails. Round tip makes it safe. Perfect for the accurate trims. Difficult to grip if you have bigger hands. A bigger handle makes it very comfortable to hold the scissors and clip the nails. It comes with a case to keep it securely. These infant nail clippers are one of the best available in the market. An infant’s nails would be very soft and tiny. Trimming them requires a lot of attention. 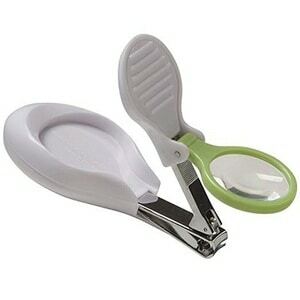 The magnifying glass with the clipper helps in viewing your baby’s nails clearly and makes you feel confident in trimming them. Better visibility of nails reduces the chances of nicks and cuts causing them unnecessary pain. The large handle provides you with a good grip and keeps your hand steady while you trim the nails. It comes with a magnifying glass. Bigger handle for a good grip. The clipper is very soft which makes it difficult to understand whether you are trimming the nails or catching the skin. The magnifying glass that comes along with this baby nail clipper is undoubtedly an added advantage when clipping the nails of babies and kids. This LED nail clipper is very convenient, and the light on it allows you to trim your baby’s nails even while they are sleeping. The clipper does not catch skin and cuts just the soft nails. This clipper comes with separate grinding and polishing heads that suit every need. The LED light makes it convenient for you to trim nails even in the night. Comes with a limited quantity of baby clippers and files. The clipper is quiet and quite discrete when it is at work. You can trim the nails on those little fingers without causing any stress to yourself. With the right kind of nail clipper or scissors, you can surely groom your little one’s nails. It would be probably easier if you had someone to help hold your baby’s hands or legs steadily while you trimmed the nails. This way you can cut the nails confidently without causing any injury to your baby. Try trimming the nails when they are more settled and calm. Cutting the nails while you are feeding them or when they are sleeping would be a good idea. In the initial days, it is best to file the nails of the baby rather than trim them. Whether you are using a clipper or scissors, remember to hold the fingers steadily and do not cut too near the edges.